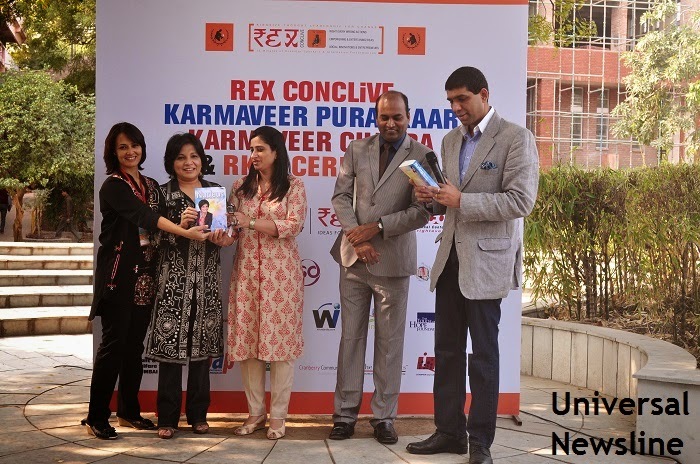 India’s first internationally acclaimed motivational speaker has launched her first book-Nucleus: Power Women-Lead from the core in REX- Ideas for Action CONCLiVE at Jesus and Mary College Chanakyapuri, New Delhi. Ms Abha Maryada Banarjee is also awarded with the prestigious “Karamveer Chakra” at the Karmaveer Chakra Ceremony. The ‘REX Karamveer Annual Award’ is designed for people with exceptional array of talent and resources and for ‘Unsung Heroes’ who have been doing exemplary work for the society to people who have innovative ideas which may make a difference to the world. Abha is the REX Global Fellow 2014 for her exceptional contribution to the field of motivation and people building.Ideas breathe life in us. REX- Ideas for Action CONCLiVE, created in 2006 is the mother of all knowledge and CULTUREtainment events in this part of the world and also the most pioneering ideas for action and wisdom forum promoted by all sectors and people who want to lead change. REX Conclive is an initiative that inspires the golden actions of leaders and is backed by one seed of a simple idea. Established on three pillars, it promotes RIGHT EVERY WRONG ACTIONS, EMPOWERING & ENTERTAINING IDEAS AND SOCIAL INNOVATIONS & ENTREPRENEURS. Abha Maryada Banerjee is India's first woman motivational speaker of international acclaim, rated as one of the Top Ten Life, Business and Success Coaches in Asia Pacific. An expert at Leadership, Human Peak Performance and Emotional Intelligence, Abha has been the Peak Performance/Mental Strength Coach for Indian Olympic Athletes.Having spoken at prestigious forums across Asia, she has coached and consulted top CEOs, Media personalities, Sports Stars, Business people, leaders in the making and has been closely associated with the spiritual aspect of Leadership as well. Called ‘Asian Oprah’ and the ‘Asian Woman Motivator’, she professes ‘Personal Mastery’ for individuals and ‘Emotional Fitness‘ for Corporates’ and Entrepreneurs for achieving human capital excellence. NUCLEUS: Power Women- Lead from the Core is the first book of its kind on Leadership and Growth for Women, the first Leadership book coming out of India and Asia. Written by India's first internationally acclaimed Woman Motivational Speaker, Leadership Speaker Peak Performance and Mental Strength Coach for Indian Olympians for 2013 London Olympics who is an ex lawyer turned Personal Development and Leadership expert. The Book is a 480 Page Super Manual and a personal growth companion for Women Leaders, leaders in the making, working women and young women in general. With iconoclast solutions from the field of law, leadership and personal development, the book introduces ground breaking solutions for issues related to gender and how to become a Leader in the gender infested environment. Published in the UK, it is also the first of its kind in the World for its iconoclast and pioneering thought connections, vision for women and its capacity to drive a social shift. It covers personal, impersonal and social aspects to Leadership and Growth. Conversational, interactive, hands on DIY exercises to have fun while you learn. The book is depicts the present issues concerning women that India, Delhi Mumbai is seeing regarding violence against women.